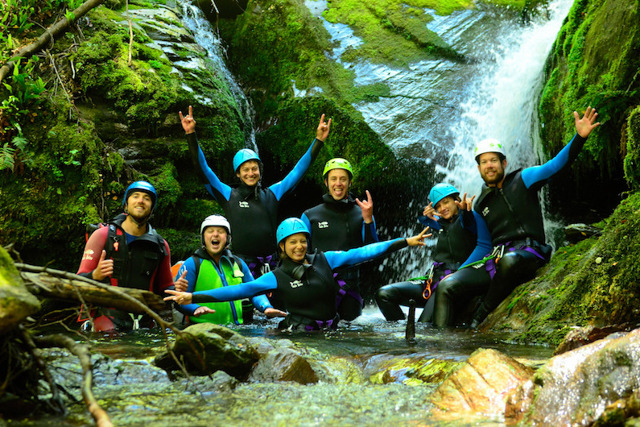 Get put of your comfort zone & step into some amazing New Zealand scenery with one of the most exciting adventure activities around. 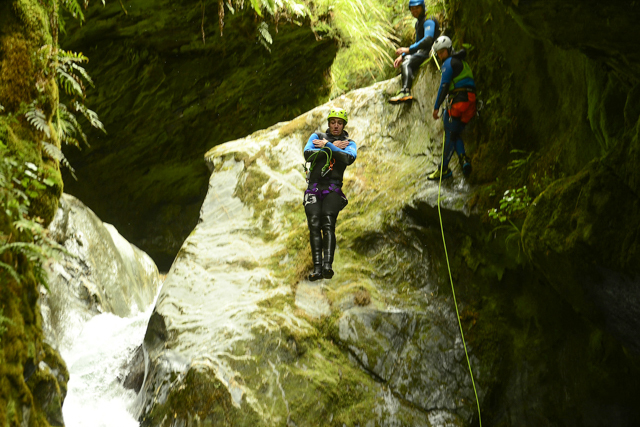 Canyoning New Zealand was started in October 2015 so we could share our passion with our adventurous customers. 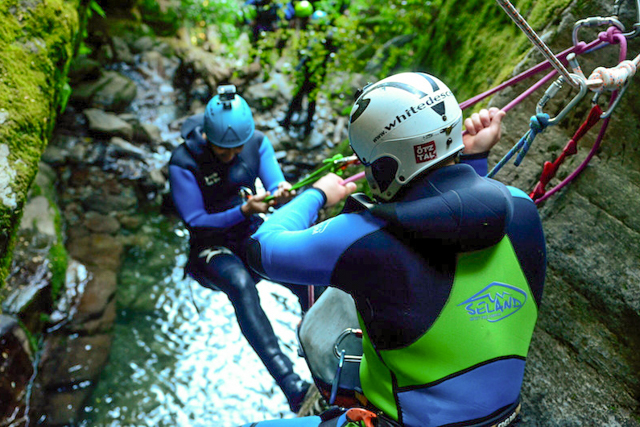 We are a small company, so we can keep it personalised and we have canyoning options for everyone, whether its your first time canyoning and your keen to try it out, or if your looking for an awesome action packed adventure to test your thrill seeking limits. 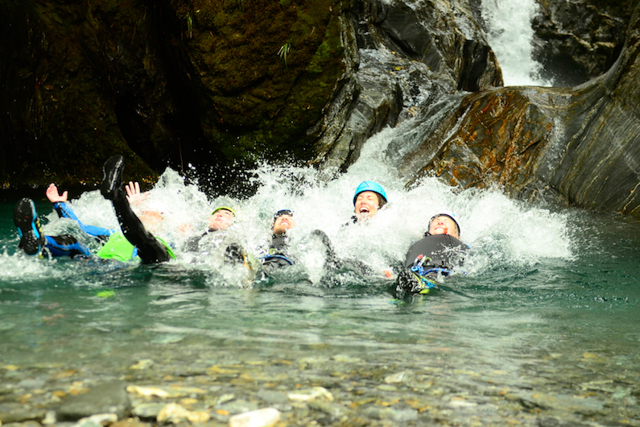 A trip with Canyoning New Zealand should definitely be a part of it! 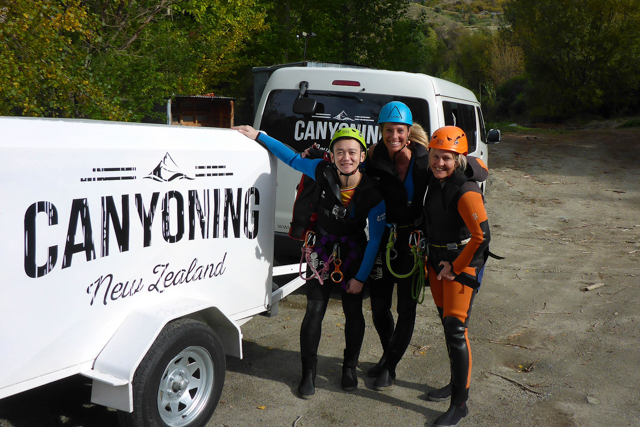 We meet you down town Queenstown for your check in, then you can drive yourself out to the canyon or take a seat in our courtesy shuttle. 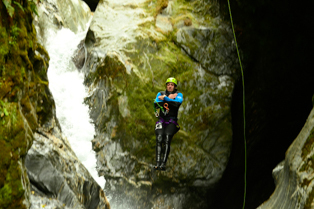 We take a drive about 20 minutes through wine country through the Gibbston Valley to the canyon start. This area is really rustic with a little tavern conveniently placed for you to visit after your trip for a wood fire pizza or a beverage to celebrate the days success! 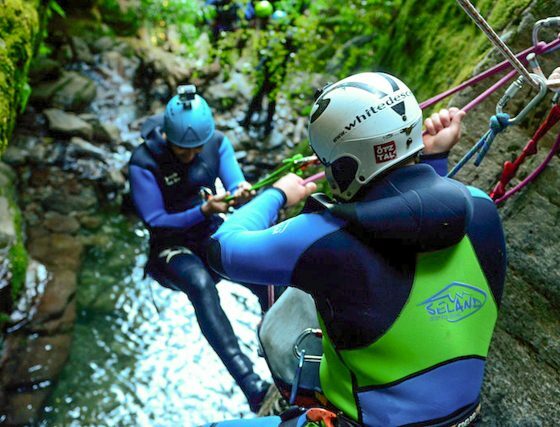 We then kit you out in all the best canyoning specific equipment and then provide a full safety briefing and demonstration from your professional and qualified guide. Just a short 5 minute walk will see you to the canyon start. 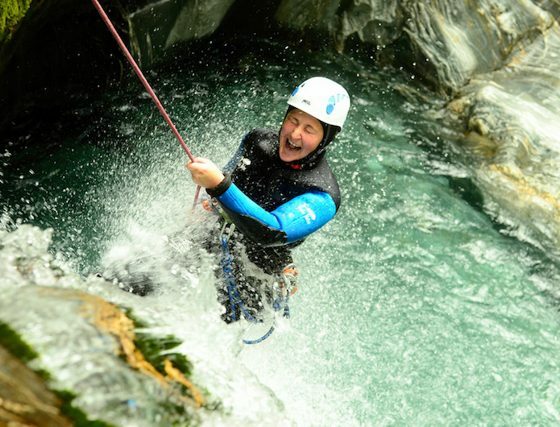 Your in the canyon for 1-2 hours where you will enjoy abseils of up to 10 metres beside beautiful waterfalls, natural water slides and down climbs. 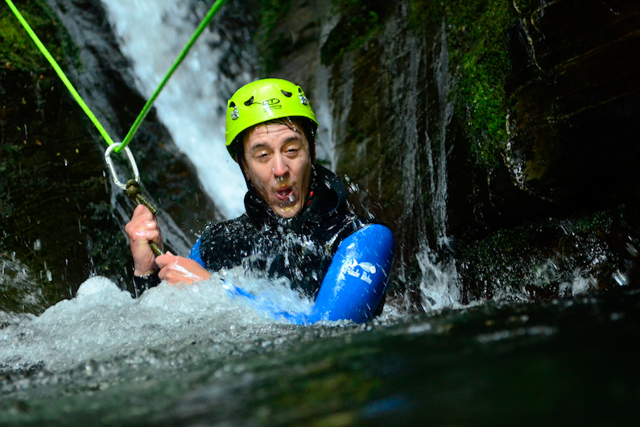 You can take your own water proof camera or leave it to us, we take pictures of your whole experience and you can purchase them afterwards if you wish. 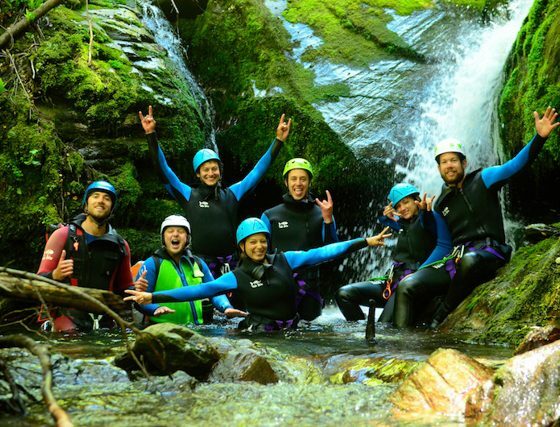 This is a real New Zealand adventure! 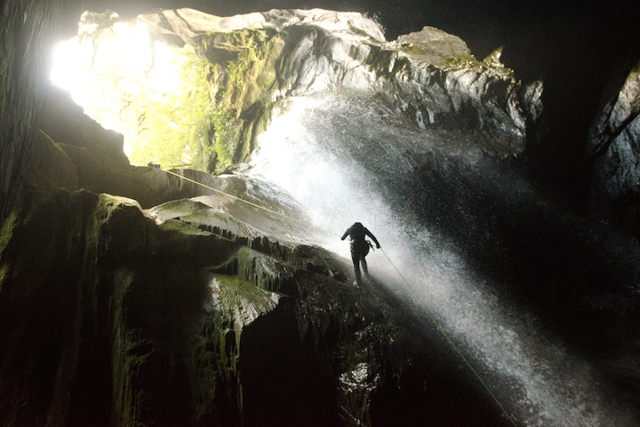 The chance to get up close and personal with an amazing activity in an amazing environment! 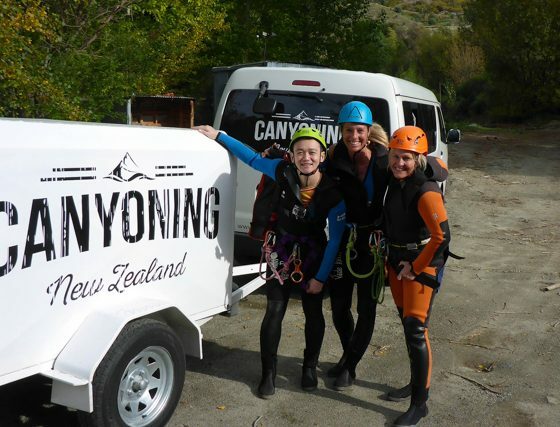 We meet you down town Queenstown where your kitted our with all the best canyoning specific equipment before your off over to the canyon on an exciting water taxi ride. 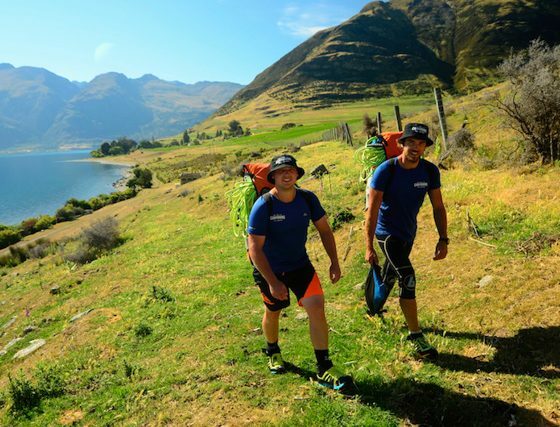 We take a hike up to the canyon with snacks, water and breaks along the way, this is the time to soak up the amazing views offered of the Remarkables mountains and the stunning Lake Wakatipu. 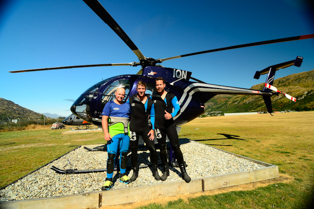 Once we reach the top we get dressed into our wetsuits and harnesses etc and then provide you with a full safety briefing and demonstration from your professional and qualified guide. 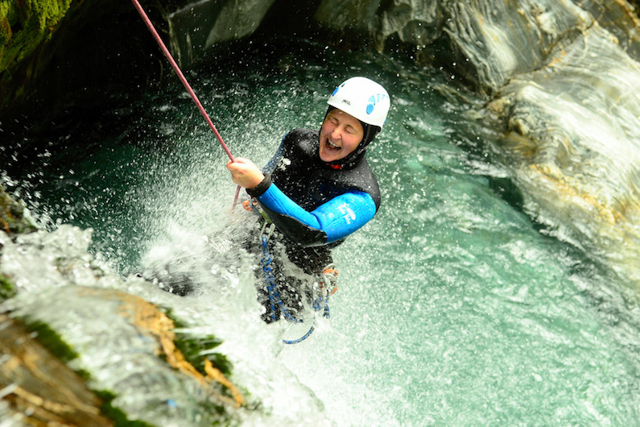 You will be in the canyon for 2-3 hours where you will enjoy abseils of up to 15 metres beside beautiful waterfalls, natural water slides, down climbs and an awesome 8 metre jump! (don’t worry the jumps are always optional). 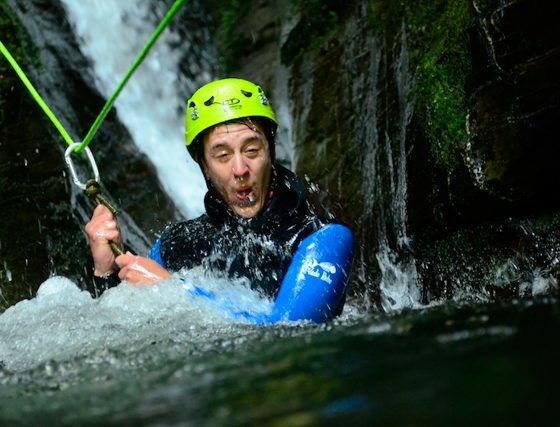 You can take your own water proof camera or leave it to us, we take pictures of your whole experience and you can purchase them afterwards if you wish. We finish the day with a picnic style lunch before your transported back to the Queenstown centre via water taxi. 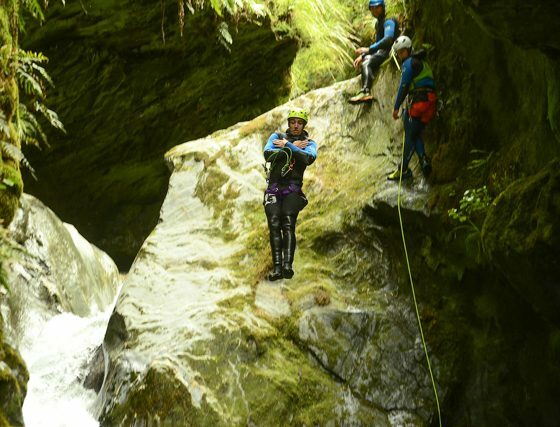 Hidden in the stunning Mt Aspiring National Park, a UNECSO World Heritage area. This day trip is a step up in adrenaline and natural beauty! If you have been canyoning before, or you’re super confident and looking for a good challenge this is the option for you! Strong swimming skills are necessary. 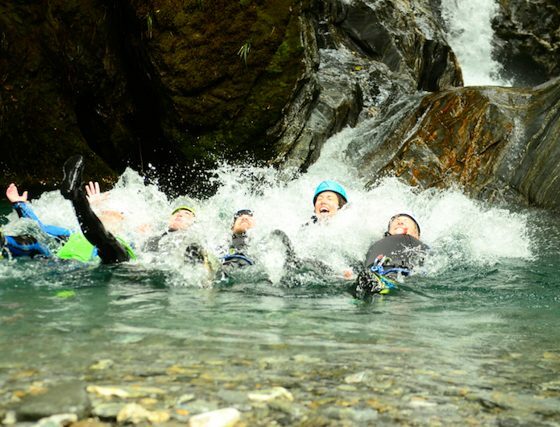 We meet you downtown Queenstown where you’re kitted out with all the best canyoning specific equipment before you self drive or take our courtesy shuttle to the canyon location. 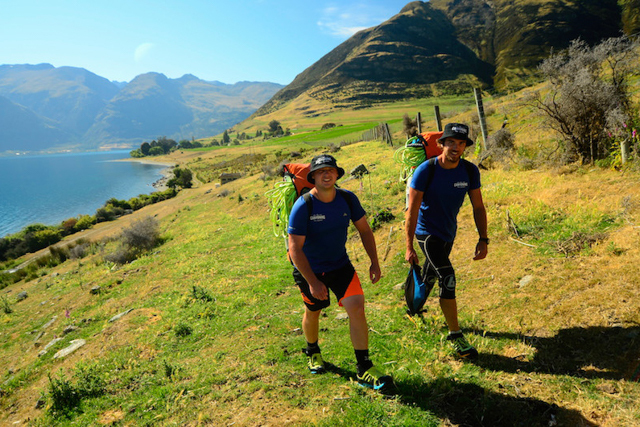 It’s a scenic 2 hour drive from Queenstown or 1 hour drive from Wanaka, with coffee and toilet stops along the way. We arrive at the canyon where we get dressed into all of our equipment and then take a 25 minute bush bash to the start of the canyon. 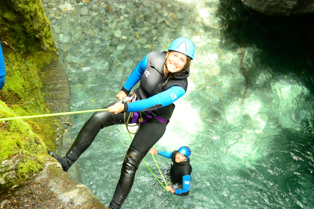 Before we start your provided with a full safety briefing and demonstration from your professional and qualified guide. 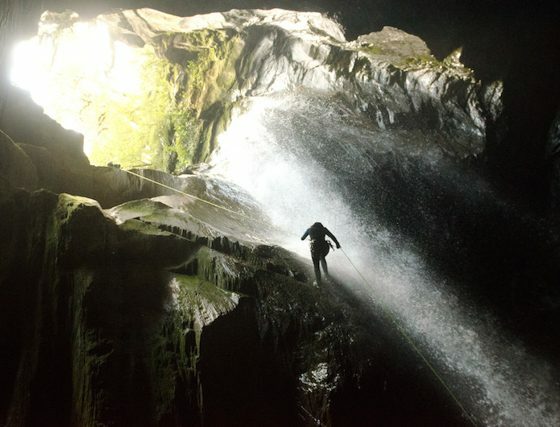 You will be in the canyon for 3-4 hours where you will enjoy abseils of up to 30 metres beside beautiful pumping waterfalls, natural water slides, down climbs and jumps, some up to 10 metres! 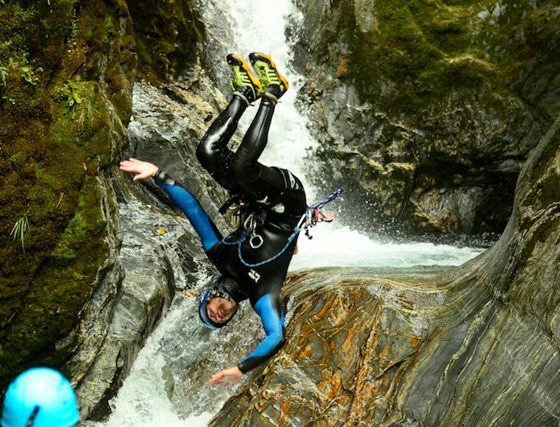 (don’t worry the jumps are always optional).You can take your own water proof camera or leave it to us, we take pictures of your whole experience and you can purchase them afterwards if you wish. 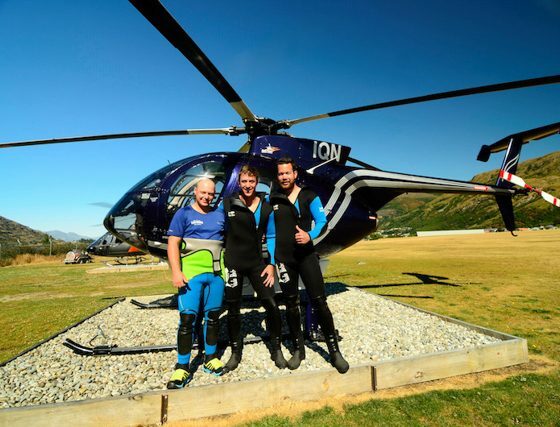 Take your adventure to the next level by adding a chopper into the mix. 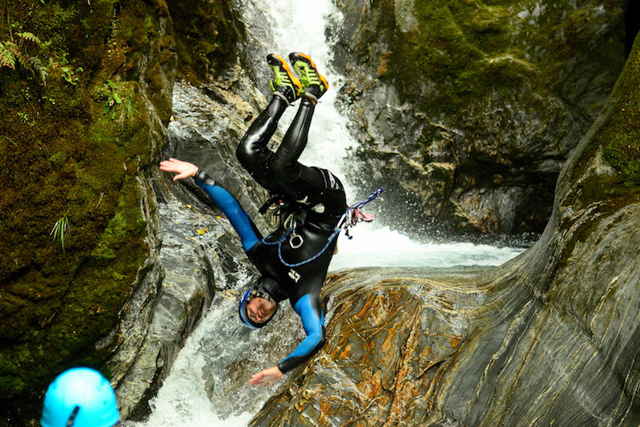 Get you’re adrenaline pumping and your adventure started in style! This trip is about getting higher than everyone else! 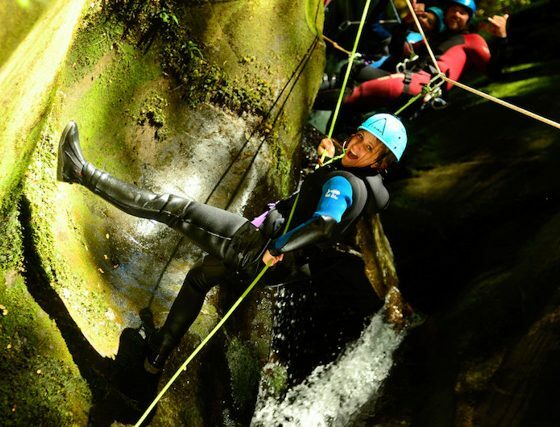 You are in the canyon for 2-3 hours where you will enjoy abseils of up to 15 metres beside beautiful waterfalls, natural water slides, down climbs and an awesome 8 metre jump! (don’t worry the jumps are always optional). You can take your own water proof camera or leave it to us, we take pictures of your whole experience and you can purchase them afterwards if you wish. We finish with a picnic style lunch before your transported back to the Queenstown centre via water taxi. 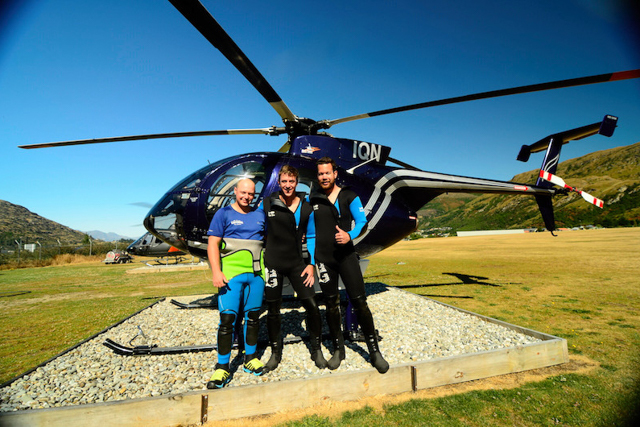 Trip includes: Pick up and drop off from Queenstown – Helicopter and water taxi transfers – All equipment and guides – Picnic style lunch.